Here is a new service that promises to make sending and receiving text messages free, and that includes international texting. It’s called mjoy and is a product of German based, Venista Group. I tried the service and it works and is free, although there are some limitations. Your SMS are free because they are sent from a mobile (or PC) web interface. So they are only “free” if you have an unlimited data plan or stay within the limits of your data bundle. 1. Sign up at mjoy.com using your mobile or PC browser. Initial registration asks for your country and mobile phone number. 2. You will receive a text with a special sign up URL, open it in your mobile browser and complete the registration process by choosing an ID and password. 3. 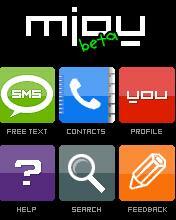 Send your texts from within the mjoy mobile web app (2nd image). The person who receives the text will see that it came from your mobile number. 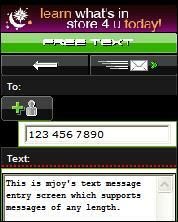 A message reading “Text for FREE with http://mjoy.com” is appended to every message. 4. If the recipient replies to the message in the normal way, by hitting “Reply” in their phone’s inbox, replying won’t be free for them and if you pay for incoming messages it won’t be free for you to receive either. 5. If you convince your friends to sign up for mjoy then you can text with them for free using the mobile web. Messages sent to mjoy members end up in their inbox in the mjoy web app (3rd image) rather than in the phone’s SMS inbox. Web based mjoy messages can be of unlimited size and there is a nice threaded messaging interface. The killer feature of mjoy is obviously being able to send texts for free to almost anywhere in the world. mjoy is available in about 180 countries from Afganistan to Zimbabwe including the US, Canada, all of Europe, India, China, Japan, Kenya, Nigeria, South Africa and even Cuba. The only country I noticed as missing was North Korea. None of this is exactly new; GizmoSMS, text4Free and txtDrop all offer similar services, but only from a “full web” site rather than a mobile one, although these sites are usable in mobile full web browsers like Opera Mini or mobile Safari. mjoy’s most direct competitor is probably the well established social network Wadja which lets members send texts for free to any number from the Wadja mobile web site. mjoy has a nice clean texting-focused user interface, although it doesn’t seem quite finiished yet. You are supposed to be able to add your contacts to mjoy so that you don’t have to key their phone numbers every time. However, I get the message “Addressb.book service temporarily not available” when I try to use it. One limitation of mjoy for me is that your account is linked to a single phone number. You can change the number and when you do mjoy sends a text to the new number with a link to validate that number. I’d like to see something more like the way GrandCentral works, were you can set up multiple numbers on your account and switch between them instantly as you switch phones. mjoy is ad supported. There are a couple of ads on each page of the site but no ads embedded in messages. There is also a search page included as a part of mjoy which offers Google, YouTube and Amazon search. The Amazon results include affiliate codes so mjoy gets a small percentage of the cost of anything you buy through them. Sending texts through messaging aggregators and carrier gateways costs real money, a couple cents per SMS. I don’t see how mjoy can cover this cost with just Adsense and Amazon affiliate revenues. Venista plans to add social networking features and more online shopping including the sale of wallpapers, ringtones and full track music downloads, which should generate considerably more income. This entry was posted in Messaging and tagged mobile site review, text messaging by Dennis Bournique. Bookmark the permalink. Hi, I’ve already done the registration recently, and have used mjoy to send message, but nowadays, I’m wondering, where’s the sign in page? Please advice! I am from Zimbabwe, I have tried several times to register with mjoy but it keeps on saying,”NOT A MOBILE NUMBER” now I don’t know what to do. Can someone help please. As far as I know all free SMS services block short codes. You have to use regular SMS for those numbers. I receive the link in my phone but where do i paste the link so i can completemy registration. If your email program doesn’t let you click the link copy it into your browser’s URL field.